1. Listen together to your loved one’s music collection. Break out the records and CDs for the opportunity to be together in a musical experience, and it helps you to learn more about your loved one’s musical experiences. 2. Use songs to spark conversations. 3. Create playlists for different times of day. Music can go a long way in setting the mood for various activities. You might want to play different music in the morning than at bedtime, for example. 4. Use music to support exercise. Here’s a fun fact: Background music can lower a person’s perception of the effort they are expending in exercise by about ten percent. That means playing some upbeat music can help your loved one get through all of those exercises needed to maintain physical functioning. 5. Choose relaxation music wisely. Because of a process known as entrainment, your body’s rhythms will tend to match the music you’re hearing. So, listen to music that is slow and steady, and you’ll feel your breathing slow and your body relax. 6. Try playing with the band. For a bit of a musical adventure, try playing a tambourine or drum along with one of your loved one’s favorite recordings. Just find a beat you can repeat and add your sounds to the mix. 7. Make up new words to familiar tunes. 8. Use music to help with bathing and dressing. Piggyback songs are especially useful for communicating information to people with dementia. Sing about getting ready for a bath, and the whole process will seem less scary. 9. Let music lead to loving touch. Sing “Cuddle Up a Little Closer” or “Shall We Dance,” and it’s impossible not to hold hands and share a hug. All of us need loving touch, but it can feel awkward in some relationships. Music can help make it more comfortable. 10. Use music for self-care, too. Don’t forget to take care of yourself, too! 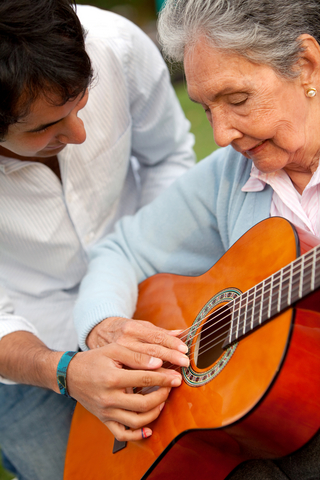 Musical experiences can help you deal with the stress of caregiving as well. Have you tried any of these methods lately? How have they worked for you and your care recipients? Wonderful list. Caregivers could try one way a week to see what works best for their situation. Consider it 2 1/2 months of exploration followed by a lifetime of enjoyment. That’s a lovely idea, JoAnn! What a lovely list. I found myself thinking about how I could adapt this list for use with young kids as well. Yes, it turns out a lot of caregiving and parenting ideas overlap! I particularly liked your comments about choosing relaxation music wisely and the concept of entrainment. I followed the link to your other post and the info about Janalea Hoffman’s therapeutic music. Her CDs that help entrain breathing and heart rate looked very interesting. Which do you recommend? Thanks, Andrea! My favorite CD from Janalea Hoffman is “Musical Acupuncture.” That one includes a track with verbal direction for relaxation and one with music only. I also like “Musical Massage” quite a bit.